Welcome to the Birds of North America! 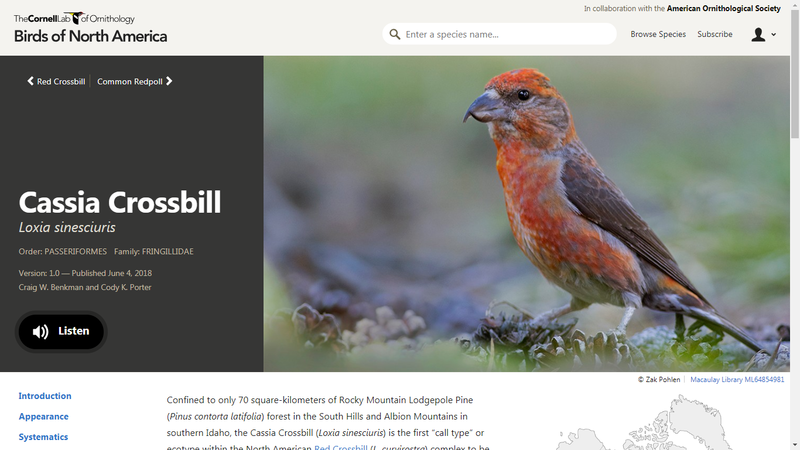 Special Guest Access to the New Cassia Crossbill Account! The Acclaimed Birds of North America! Birds of North America (BNA) is the most comprehensive reference for the life histories of over 760 bird species that breed in the United States (including Hawaii) and Canada. Species accounts are written by ornithologists and other experts and are an essential reference for anyone with an advanced interest in birds. BNA accounts have always offered an in-depth, authoritative summary of scientific literature and media. However, in combination with the Macaulay Library and eBird, our restructured species accounts are now accompanied by new sounds, images, and video, and distributional maps and model output generated by eBird. Access to the entire Birds of North America database (text, photos, audio and video for all species) is available through subscription. Subscriptions start at $5 USD for 30 days with 1, 2 and 3 year options also available. Individual subscriptions to BNA can either be purchased online or over the phone (1-877-873-2626, M-F 9:00-4:00 EDT).